Join us in Rome & Asissi! NEW! 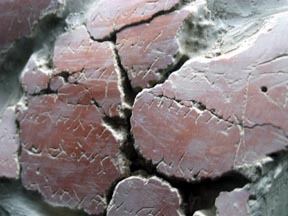 Rome Pilgrimage In October 2007 is now Finalized. Click here for the Brochure! Steve & Janet have been to Rome over 45 times — exploring and filming, guiding and enjoying the history of our Church. 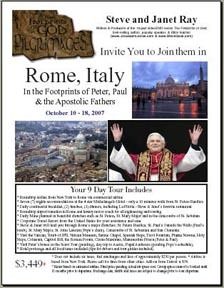 Now they will take you to their favorite places in the Eternal City to follow the Footprints of Peter, Paul & the Apostolic Fathers. Find out in my new Document filled with Quotations, Verses & Additional Resources on the Communion of the Saints. Feel free to download and print them out. Click here to listen to Steve and Sean Also, follow their links to listen to the archived show later. In this Q & A format Steve will discuss why we venerate the saints, how we can pray to them, the the stages of the Church, and other related topics. 1) For Key Bible verses, Quotations & Resources, click here. 2) Steve's Article: Mary, Saints & Worship: Do Catholics Worship Mary? 3) To read more about the Communion of Saints, click here for a great resources at Catholic Answers. To learn why Steve Ray converted to the Catholic Church, click here for his story and here for his talk.